3. A. 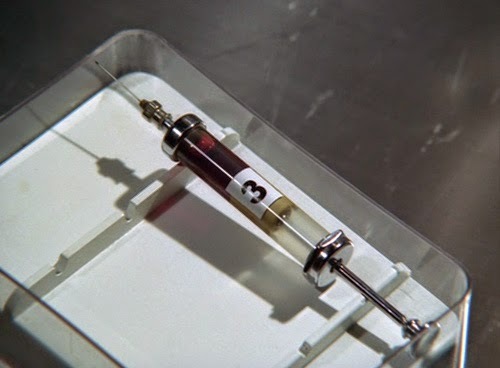 B. and C.
An under pressure Number Two orders Number Fourteen to test an experimental drug on Number Six in an attempt to extract the reason or his resignation. Two is convinced that Six was planning to sell out, and has narrowed the suspected parties down to three; “A”, “B’ and “C”. In an induced dream state, Six encounters each in turn at an extravagant party. But Six becomes increasingly aware of the artifice and manipulates the third dream to introduce “D”, revealed as Two himself. The reasons for Six’s resignation remain unrevealed, and Two must face the music. There’s a deceptive simplicity to A. 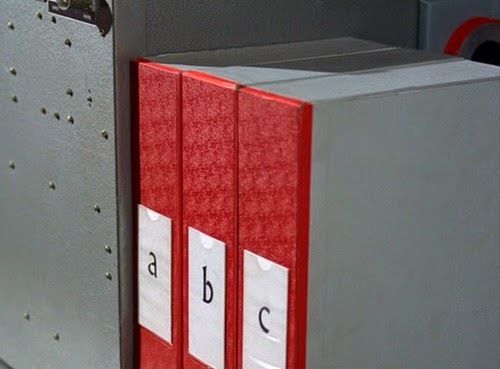 B. and C. It leaps headfirst into a science fiction plotline and refuses to get ensnared in the finer details; a Village technique allows the infiltration of dreams, and there are three chances to extract the truth from the ever-resistant Number Six. One might level the charge that three chances are two too many of padding, but with such a colourful idea and the first (as broadcast) real clash of wits between Six and a Number Two it never fails to engage. And it also provides that rare thing (in any medium); an intelligent, visual witty and wholly satisfying ending. A. 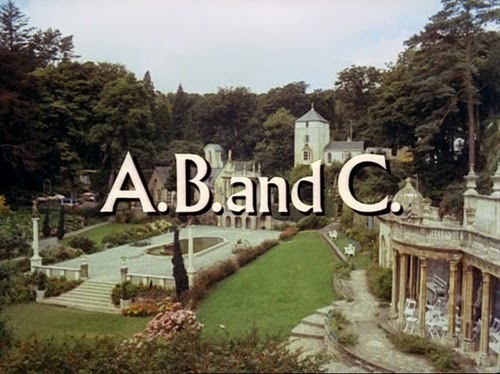 B. and C. is oft cited in the debate of the correct running order of the series. As I’ve said, I’m quite content to continue to revisit the series in broadcast order. But the placement of this one before The General has the guest Number Two against it. Colin Gordon plays Two in both episodes (and quite wonderful he is too; he proved similarly winning in Doctor Who’s The Faceless Ones about six months earlier). The problem is, Two here is nervous and clearly under pressure from his superiors. In The General he is the “new” Number Two (here he announces himself just as “Number Two”) and somewhat over-confident. Against this is that in The General he refers to himself and Six as “old friends”. A. B. and C.was filmed 10th and The General 11th so, if it was intended to be placed prior to A..., it must have been consciously retrofitted. 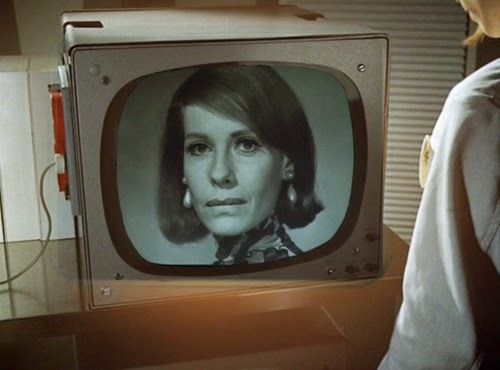 In terms of broadcast order, I feel there’s a sufficient gap between the episodes (The Generalcomes sixth) for it not to be a too-pressing concern. This is one of the most self-aware of episodes; the original title Play in Three Acts references both the repetitive structure and the “play” of the contest between Six and Two. 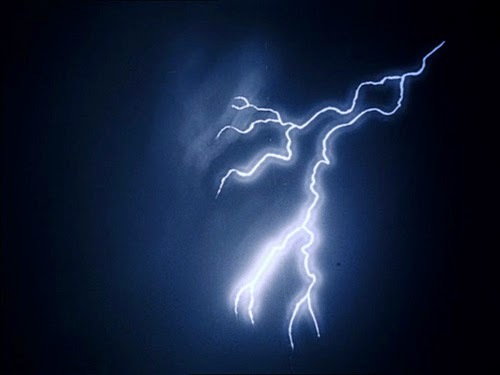 It has been noted by others how we open on a stormy night, with Six on an operating table (it’s 15 minutes before we see him in his familiar habitation); director Pat Jackson (his second of four episodes) consciously references Frankenstein and his untoward experimentation. It also puts us in the realm of the altered state; this is less sci-fi than twisted fantasy. 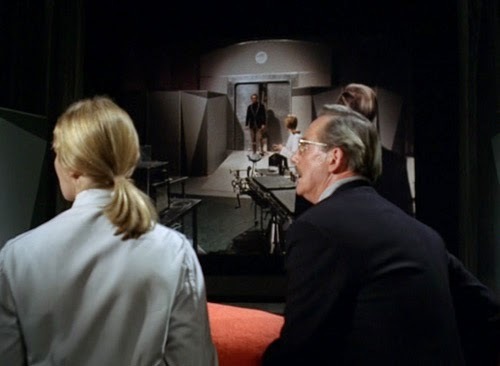 The emphasis on viewing the contents of Six’s subconscious, projected on the huge monitors in Two’s control room, makes a direct link between the viewer and Two (as, indeed, we cut from the control room view into the dream itself). 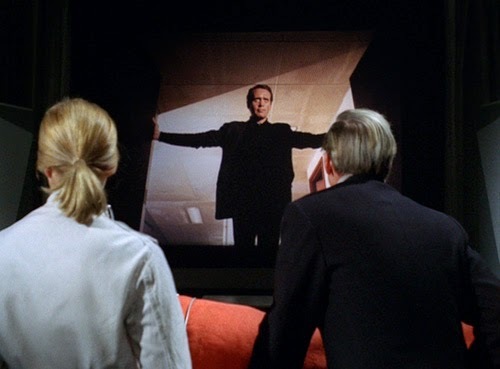 Jackson takes care to foreground the physical Six with his dream form on the screen; it’s an early heads-up that this series is really all about his interior state, not the external trappings of why he resigned and who runs the Village. The nature of Six’s lucidity or otherwise, and the control or manipulation of him in his dream state, draws attention to the nature of the storytelling of which he’s a part. This shouldn’t be over-emphasised, as I don’t necessarily think the episode is designed to be purely self-reflexive (unlike, say The Girl Who Was Death), but Jackson and writer Anthony Skene are clearly expanding on elements arising naturally from the story-within-a-story premise. 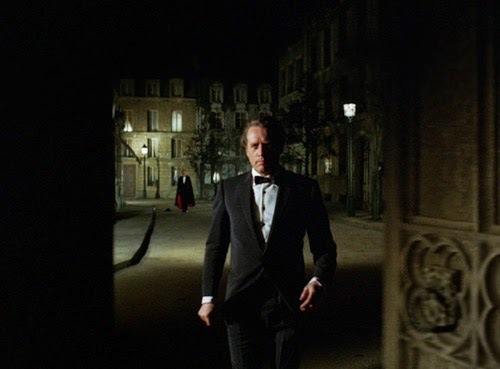 When Six arrives for his third bout of partying, the camera lurches at alarming Dutch angles, before righting itself when he straightens a mirror (and thus his own perception); again, this suggests a direct line into Fall Out. Which culminates in the final reveal (to Two and to us), where Six advises, “We mustn’t disappoint them, the people who are watching” as he unveils the identity of “D”, verbalising the meta-commentary. 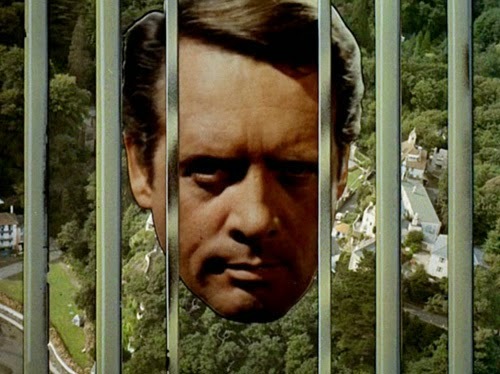 Most dazzling of all, Jackson works in a hint of infinite regression, as the dream Six, having unmasked “Two” as his co-conspirator, is observed walking into the control/test room, handing the envelope full of secrets (holiday brochures) to a third “Two” and then taking his place on the operating table (just as he is in the “real” world). The crowning moment of genius comes just before this, as Two and Fourteen actually expect dream Six to walk through the doors of the real control room. Fourteen: He’s only doing what he would have done. I can only create the situation. 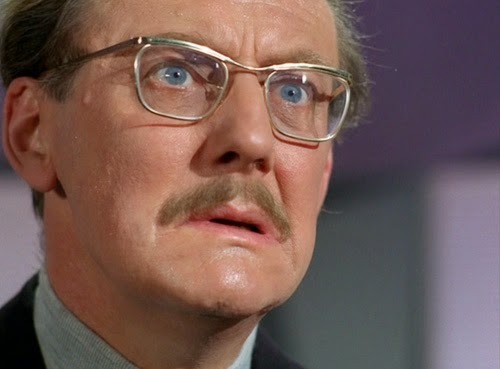 Anthony Skene wrote two other Prisoner scripts; his first was the another stand-out, Dance of the Dead, and his final one the slightly less illustrious Many Happy Returns. In some respects, this is a natural progression from Dance (where the high-strangeness there acts as a precursor to the pagan sacrifice of The Wicker Man). He sets up fairly straightforward dream logic rules; Fourteen can dictate the scenario and main players, but Six remains the unpredictable element. Additionally, Skene limits the game; three tries and they’re out of options, as a fourth attempt will kill him (it’s therefore very fortunate that there are precisely three possible co-conspirators). The “dream in a syringe” has more in common with the choice of pills in Alice in Wonderland than anything that bears analysis. And that’s as it should be; all that is necessary is the paraphernalia of science. There are clues from the first that Six is aware that he is being manipulated. As Fourteen prepares him (“His mind is now yours”), Six awakes and stares at her. 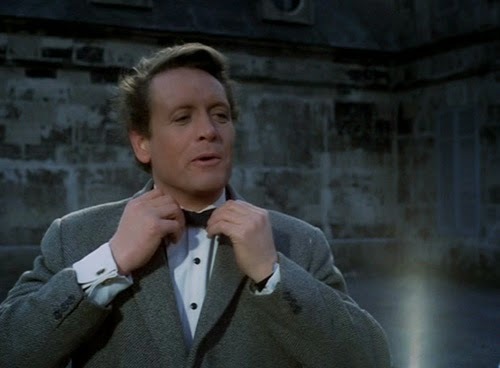 After he engages in fisticuffs with “A”’s henchmen he adjusts his bowtie and intones “Be seeing you”, a greeting that he only learned in the Village. It isn’t explained how Six is able to martial his dreams, to the point where we see complete lucidity in the final sequence. 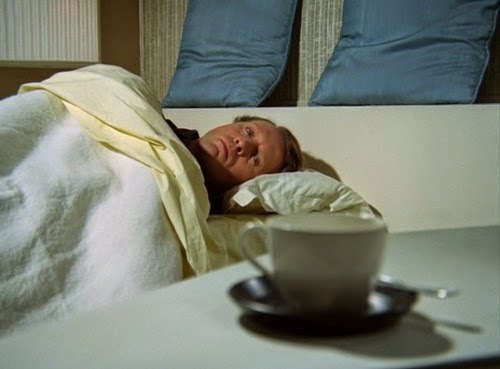 When he is first shown dreaming he is going over his resignation in his sleep, so it appears that he does not have complete control of himself to prevent prying eyes and ears. Wouldn’t he let something slip eventually if they just kept monitoring his dream state? Presumably the answer is that time is of the essence, hence the pressure on Two and the threats he, in turn, holds over Fourteen. Two: Yes, I realise my future’s at stake. 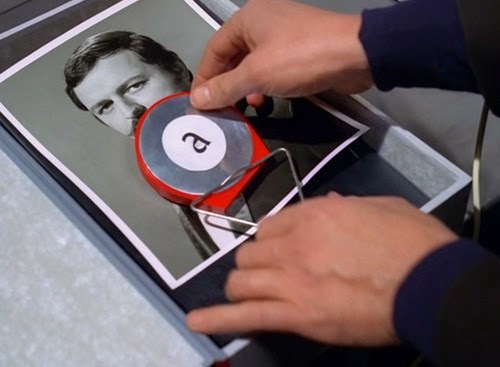 If the first two episodes presented a relatively at ease Number Two, albeit one who nevertheless required reassurance that his lack of results would not be a black mark against him, the third features a Two who is up against it. 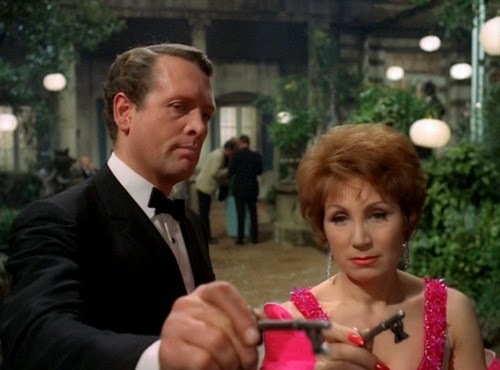 The ominous red phone is consistently placed in the foreground of the frame or shown in close-up, an alarm bell informing him that the clock is ticking. His milk drinking does not suggest a relaxed persona but a nervous one. We’re all answerable to someone, and for all his power this Two is just a cog in a wheel. We can feel his fear when he stares at the ringing phone in the last shot. This is a very significant shift in the series at an early stage, and a necessary extension of its themes. The controllers are controlled, no one is free. 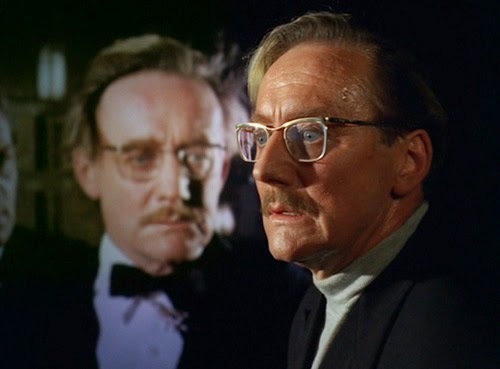 For all the lively bonhomie of Leo McKern’s Two, Gordon is my pick of the four we have seen so far. His desperation affords him an extra dimension to play with. A: If you haven’t got a price, you must have a reason. It’s interesting that Six is willing to wave in wave in Two’s face that he is onto him, displaying his needle-marked wrist and stating that Fourteen is his favourite doctor. One wonders if it is the best strategy but it certainly has the effect of further unsettling Two. Two: If this man is damaged I shall hold you responsible. Fourteen is the only other “real” person of note in this episode. Good as she is Sheila Allen isn’t given all that much to chew on. She’s a diligent scientist, concerned for the welfare of her patient and unwilling to push the use of an untested drug to dangerous levels. Six: How does one talk to someone that one has met in a dream? Even though Six contrives to meet with her in the Village, the structure of the episode ensures that she isn’t given a chance to develop self-doubt or transform into an accomplice. Perhaps the only less than satisfactory sequence is where Six tails Fourteen, gains access to her lab and dilutes the ‘C” syringe. It’s jolly convenient that the Village surveillance isn’t observing him when he’s performing such a crucial task. And how crucial was it anyway? The resistance he showed with “B” suggests he was turning the experiment his way even without that extra bit of help. A: What are you going to do with your freedom? 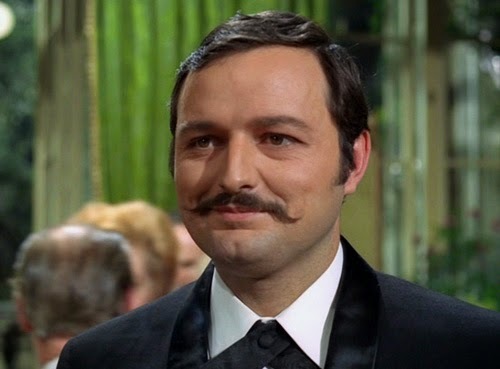 A young and slightly chubby Peter Bowles plays “A”, and his sparring with McGoohand is elegant and witty. Bowles was a familiar face in ITC series of the ‘60s. 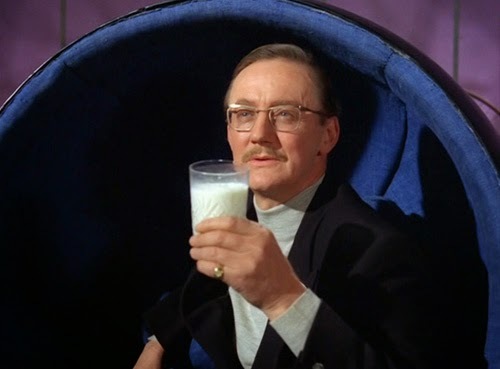 He also appeared in four Avengersepisodes. “A” provides a straightforward establishing scenario. 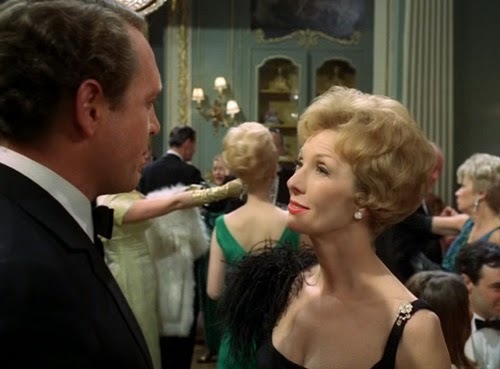 We’re introduced to the party and the middle-aged but vivacious hostess, Engadine (a vibrant and engaging Katherine Kath; McGoohan has an easy chemistry with her that further undermines all the tales of his prickliness when sharing scenes with his leading ladies, especially since Engadine is overtly mock-flirtatious). The pragmatic “A” clearly doesn’t work for the same people as Six (“Sides don’t matter. Only success”) and fails to get him to bite, signalling the first punch-up of the episode. Engadine: A woman’s hand. I’m jealous. 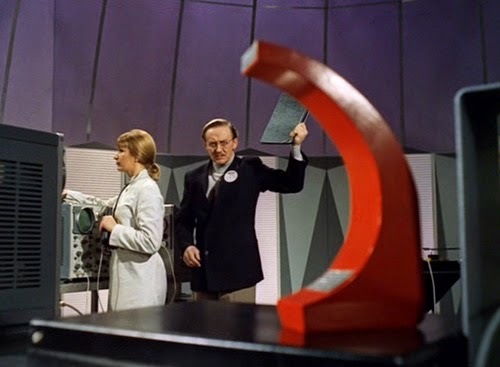 “B” looks to be the weak link of the dream scenarios, as Annette Carrell’s potential co-conspirator isn’t particularly distinctive. Until Fourteen pushes the idea of placing words in her mouth, that is. Six: You are not who you pretend to be. A second bout of fisticuffs subsides into a standoff; a gun is held at “B”’s head and she asks for the reason for Six’s resignation. 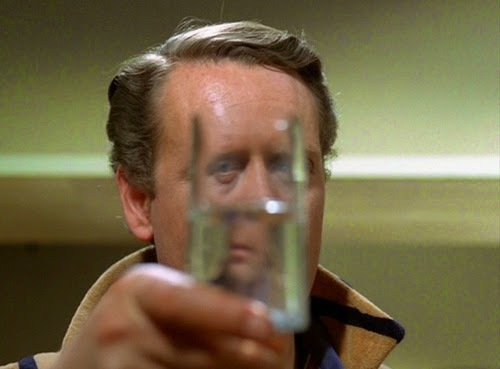 As with the most satisfying Prisoner episodes (from Six’s perspective), his ability to discern the lie makes him a refreshing hero; it’s his shrewdness and intelligence that gives him the edge, not brawn. He’s unmoved by the plight of a damsel in distress, and leaves her to her fate. 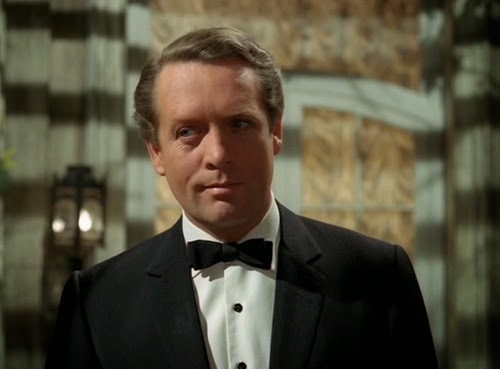 Again, the implacability of Six marks him out as different; whether or not that’s a consequence of McGoohan and his take on female characters, it’s always interesting. He can’t be swayed by appeals to his sentimental side. This may just be a dream, but it differs significantly from his plea for mercy for Eight in the previous episode. Six: Terrible? It’s dreamy! THIS IS A DREAMY PARTY. Albert Elms’s scoring for the ker-azee psychedelic third dream is one of the very best pieces of incidental music in the series; it’s very, very groovy and informs the tone of the dream and reflects backwards on the episode as a whole; The Prisoner is out there, man (this may be why Roger Avary rather clumsily tries to Tarantino-ise the episode by referencing it in Killing Zoe)! 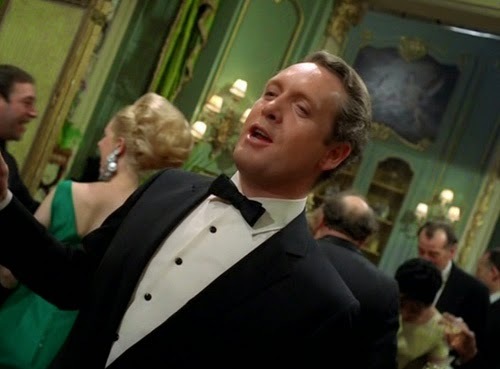 There’s something joyous about seeing McGoohan in a “with it” setting. The same is true of the conscious referencing of the prevailing youth movement in Fall Out. 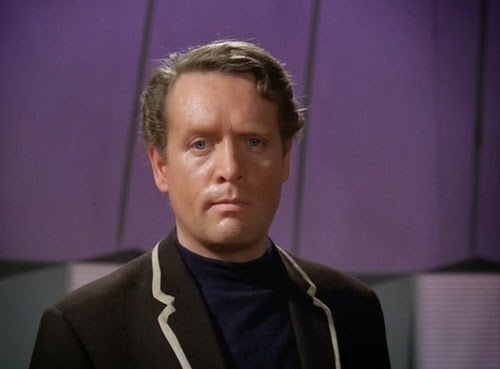 McGoohan, particularly with his distinctive wardrobe and considered posturing in The Prisoner, is an instantly iconic presence. He exudes a sense of cool that allows him to engage with the cultural landscape of those two decades younger than him. 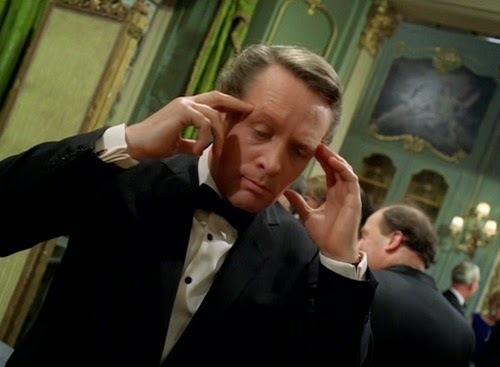 We don’t respond to his “tripping-out” in this section with the embarrassment of seeing an old man attempting to be hip (as, surely, a 20 year-old would regard most 40-year olds) because McGoohan has fashioned his own sense of self-significance, unreliant on the overt approval of his peers or a younger generation. It’s one of the reasons the series retains it’s unique timelessness, in spite of being readily identifiable with the era that birthed it. Two: We’re bringing her to the Village. “C” sets up a mystery, as there is no photo of this potential colluder. As a result, we first assume it must be Georgina Cookson’s unnamed blonde woman. 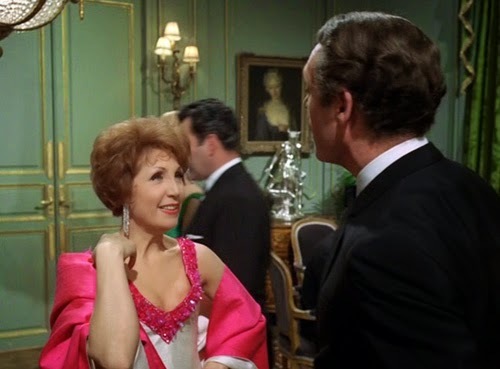 Cookson also plays Mrs. Butterworth in Many Happy Returns. There appears to be no intention to suggest these two characters are the same person (even if A. B. and C. was ordered later, it wouldn’t explain why Butterworth would be a part of the dream scenario). 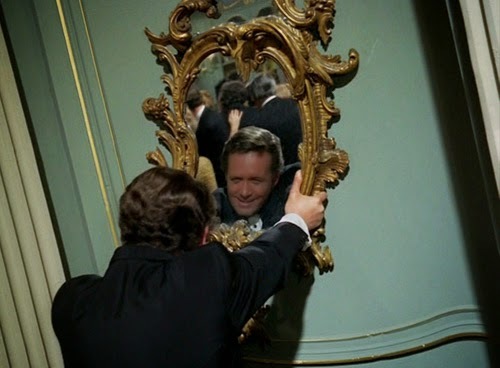 Then again, it’s not clear at what stage Six exerts control of his final dream (when he pulls the mirror to? This seems most likely). If she is his own invention, then he might just be rifling through his memories and picking the new resident of his London address. 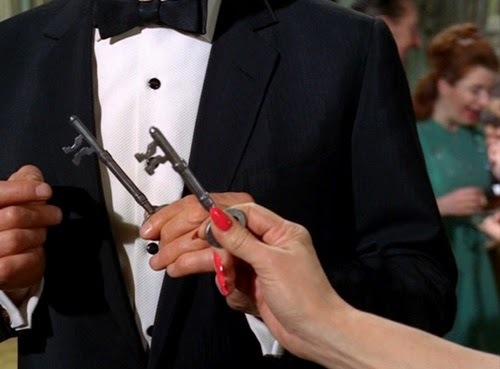 The blonde is revealed as the go-between with “C”, as she gives Six a diamond which is then exchanged for a key; “C” (Engadine) proffers an identical key. It’s a neat bit of writing on Skene’s past, as it works both in terms of dream logic and as spy trade. By this point the role reversal is complete; the manipulator has become the manipulated. 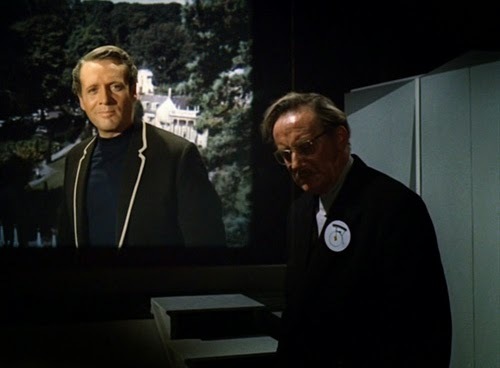 Two cannot disguise his excitement over the news that Six is going to meet “D”; the reason he wasn’t on Two’s radar is readily apparent when he is revealed as Two himself. 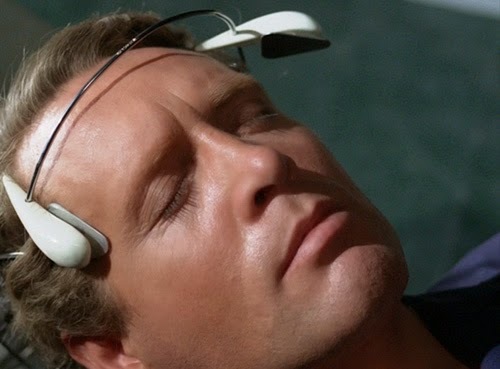 We’re gifted a perfectly formed resolution; it doesn’t really need to stand up to logical analysis (as in, how precisely did Six control his own dreams so skillfully?) because it satisfies intellectually (the quest for answers is turned back on the inquisitor in the most comprehensive manner) and emotionally (Six may remain in the Village, but he has decisively triumphed over his keeper). Six: I wasn’t selling out. That wasn’t the reason I resigned. A. B. and C. is a permanent fixture in my Top Five episodes of the series. Perfectly structured and complemented by direction that brings out the best in the material, it is also blessed with some of Elms best incidental music for the show. It’s really dreamy!